As competition in restaurants heats up, it takes a lot more than an idea, talent, experience, and a business plan to open and operate a successful business. It also takes a lot of money, especially in cities where real estate has exploded and left a mess in its wake. Private equity and big dollar investors have rapidly changed the restaurant industry as restaurateurs and chefs look to people and institutions to back their ideas and concepts, both new and growing. In one way, this is why restaurateur Danny Meyer started his New York City-based private equity fund: to help young restaurants with good ideas grow and thrive where they may have otherwise seen prohibitive barriers to entry. Chef Dan Barber and brother David have done something similar with Almanac Investments. But this isn’t about good feelings, food, and restaurant tech, this is about old-school independent restaurant startups and the very, very high costs of getting off the ground. In the past, the big investors have stayed out of top markets. Players including Argonne or Roark or Sun Capital have stayed in the suburbs with safe plays on everything from Boston Market to IHOP. But, really: How much fun is that? Now you need, or want, something more that suburban implants in urban centers or rolls of the dice. The era of the rich kid (or immature adult) with cash who wants a nice table on Friday night has been eclipsed by investors who see an opportunity to create an experience that can command high-dollar amounts from single evenings, and then duplicate that experience elsewhere. And banks? They’re not really interested in investing in moonshots at all. Whereas retail chains may be able to stomach insane rents by simply thinking of them as a branding exercise, independent restaurants don’t have that luxury. Even brand name operations with full dining rooms such as Guy Fieri can’t keep up with the demands of landlords. So you need an investor with very deep pockets and a horizon that means they won’t get bored or quibble after a few years of unprofitability. In New York City the biggest opening of 2017 cost north of $30 million, a number that’s so far beyond friends and family or even trust-fund buddy that it is laughable. Still, backers like this often remain silent event when their pockets are much deeper than we’ve see in the past. In many cases, the aura of independent creative chefs is a much more compelling marketing position than nine- to ten-figure investor-backed group. While this is often the default position — based on tradition more than an attempt at obfuscation — others are open with where the money comes from. That’s why giant players such as Related Companies are taking long views of restaurants and thinking of their investments as a part of larger retail or residential plays. In November the firm put eight figures into Christina Tosi’s Milk Bar empire. They had earlier invested in David Chang’s expansion into Las Vegas and elsewhere (including an ambitious Columbus Circle experiment along with others), as well as fast casual startup &pizza. This, really, is where it gets exciting. 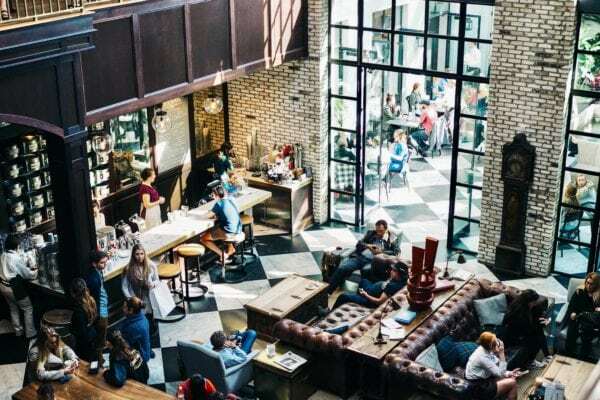 The transparency may be new to the industry, but it will ultimately be embraced by restaurateurs looking for people who can bring more to the business than simply some cash they need to park somewhere for tax purposes. For companies like Related, it’s about creating distinctive, diverse spaces that go beyond the dining room and into how a city lives. And about creating destinations where people want to live, populate, shop, and more. Although Related has significant marquee spaces, it’s not alone. It’s New York competitor Brookfield turned Battery Park City into a food destination by investing in independents, not chains. Like other smart investors in major markets, they have learned that the next great dining destination will not come from a global chain, but from an independent with enough financial flexibility to get the right real estate at the right price, without having to worry about a dodgy investor demanding unrealistic returns. The restaurant industry has long been a place where the myth of the creative culinary genius was all you needed to make a restaurant successful. We know that wasn’t true. Now there are investors who want to bet on that realistic appraisal of the industry, and it can be a good thing.